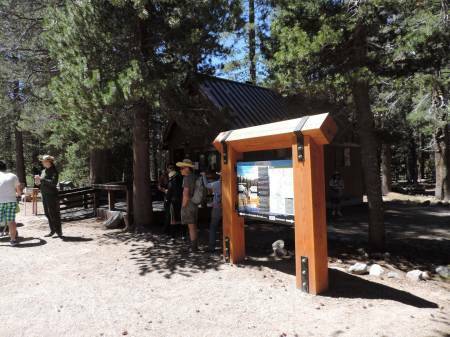 Devil’s Postpile National Monument Ranger Station is only open during the summer months, and luckily it was open this Memorial Day weekend. During that time you take a shuttle from the Mammoth Mountain ski area to the canyon which has hiking, Red’s Resort, as well as the monument. The road is steep and very narrow, the $7 adult shuttle ticket is well worth the cost. As the shuttle arrived a ranger was there to meet the crowd and give out brochures and Junior Ranger booklets. 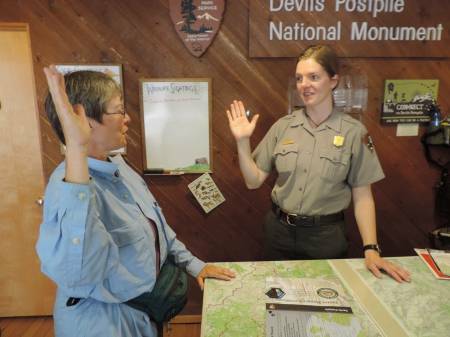 We both recognized each other, Ranger Elsa was the ranger who gave a nature walk last September whenI was in Yosemite. 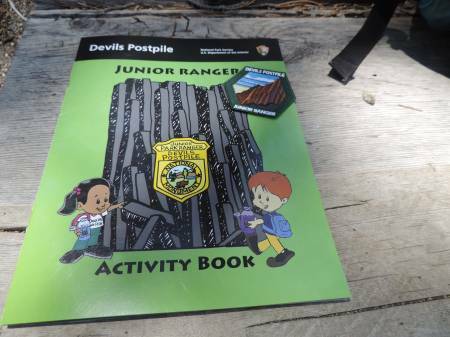 My grandson and I did our Junior Ranger badges together. She was excellent with the kids. This program is considered Senior friendly as it indicates it you are over 10 years of age you should complete 10 activities. There was a total of 12 activities. I spent about 3 hours completing the 12 activities. A younger child could easily complete their activities in less than an hour. If you do not complete it before leaving the bottom, the multi-agency visitor center in town has the patches. 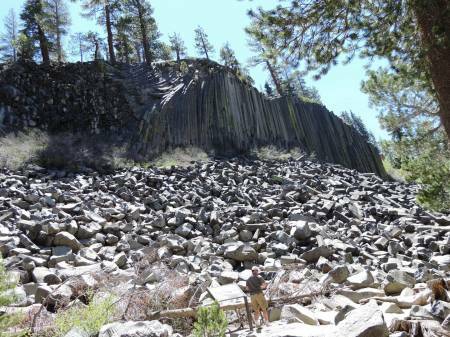 In order to complete several of the activities you need to walk the 0.4 mile up the trail to the unique rock formation for which the monument is named, additionally you need to walk up to the top to make several observations and drawings. The Rainbow Fire maze was one of the more difficult mazes I have had to complete. Besides working the maze you had to identify animals that return to an area after a fire, based on the type of plants as they return. 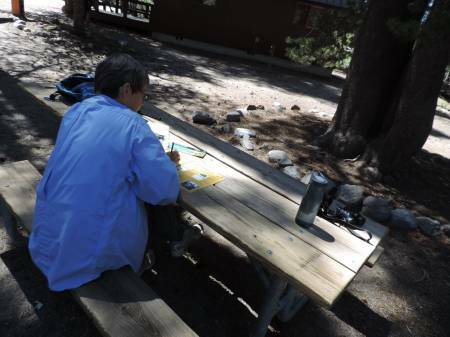 The Scavenger Hunt had you draw in several items you can find along the trail, as well as something for your to add. Again I enjoy the drawing activities. Overall I enjoyed the activities and the time spent at this national monument. The river, views of the Sierras and the unique geology come together to make a most enjoyable experience.